Throwing a bottle as part of the celebration – definitely a new one. It is all but confirmed that Joaquim Rodriguez has won the WorldTour, thanks to the fact that Bradley Wiggins can’t get a Visa for the world’s least exciting race, the Tour of Beijing, and thus cant go and get the points he needs to overhaul the lead Purito took when he won the Tour of Lombardy in the pouring rain. Thus ends another season long competition in a sport that isn’t really about season long consistency any more, but has featured such a competition since at least 1948. What follows is a brief history of those competitions, what they entailed, followed by if we really need one at all. Named after Henri Desgrange, one of the founders of the Tour de France, with the jersey that still bears his initials, and Emilio Colombo, an organiser of the Giro, this competition was organised by the three big cycling Newspapers, which are still the ‘Big Three’ today – L’Equipe, La Gazzetta dello Sport and Het Niewsblad, as well as the dead Les Sports. The competition involved taking the postions of the riders in the top events of the three cycling countries: France, Belgium and Italy. The events that counted towards the ranking where from France – The Tour de France, Paris-Roubaix and Paris Tours, from Belgium – The Tour of Flanders, Paris-Brussels and Fleche Wallone, and from Italy the Giro d’Italia, Milan San-Remo and the Tour of Lombardy. The Vuelta, for those wondering, was not included as the race would not be run in 1949 or from 1951-54, having already missed 6 editions since its 1935 founding due to war both Civil and international. It was eventually inducted into the system in 1958, as were other races as time went by: The Tour de Suisse became the first race outside the three main countries to be included in 1949 whilst the oldest race in the Calender, Liege-Bastonge-Liege, was added in 1951 The points system of the competition seems to have been lost, aside from that all events where equal bar the stage races, which were worth double. It also featured a nation ranking. 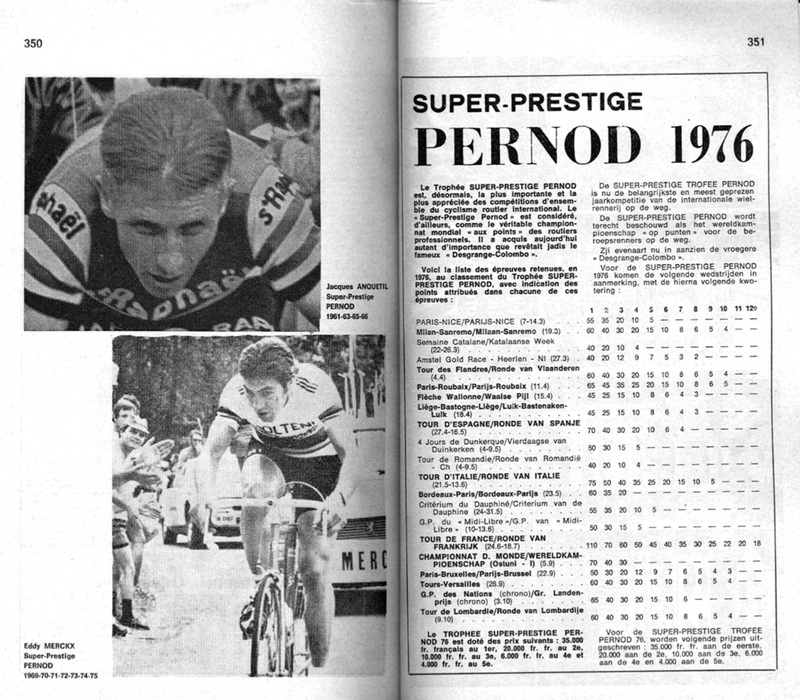 The Super Prestige Pernod was the replacement for the Challenge once the newspapers running it fell out. Pernod, the alchol company, had been running a French only series ranking the year before, and so simply opened its doors to international competititors in 1959 to create a new world ranking. 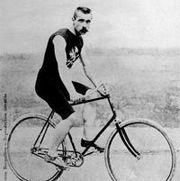 The series was extended in scope up to twenty races in all – Paris-Nice, the Dauphine Libere, Tour of Catalonia and the Tour of Romandie. Only the top 10 in any race scored any points, forcing the cream to the very top, although due to the French sponsor and backing, some French races gained a rather over large number of points – Milan San-Remo was equal with Bordeau-Paris, for instance. 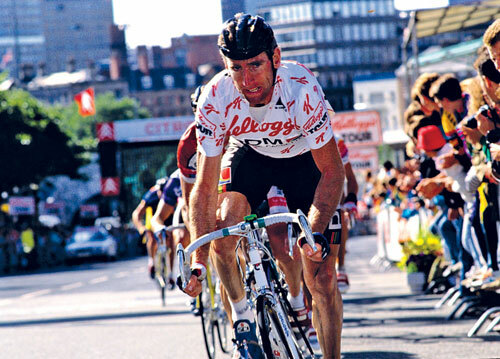 The system eventually died when French law prevented the advertisment of alcohol in 1988, which meant the death of the system and the beginning of the centralised UCI versions. The first of two UCI rankings that would overlap, the World Rankings was the UCI’s attempt in conjunction with the Bike-Magazine (that’s its name…) and devised by Jean Marie Leblanc to emulate the ATP Tennis world rankings, and thus to provide an accurate reflection of the seasons best rider. The system included virtually every race on the calender on a scale that took into account their difficulty and prestige, then made it even more complicated by making everyones points count for three years – they just lost half of their value every year. Thus, if you scored 60 points in a race one year, the next year, those points stayed on your tally the next year, but where only worth 30. The next year, they were worth 15, then dissipated the year after that. This was seen as too complex in the end, and so only the results for the year before were included, meaning that defending a title was worth it. This was also the beginning of the idea of dividing teams into divisions based on their points, which made transfers based on points all of a sudden occur. The classification was however different to its predecessor in that it took into account far more placings then just the top 10 of the Super Prestige, and thus meant that runners up, rather then winners, were more likely to take the overall if they rode more. 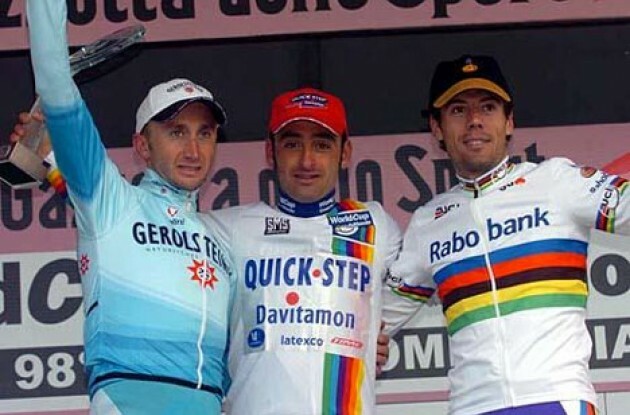 Bettini, central, in the World Cup jersey, next to Freire in the World Champions jersey. In 1989, Hein Verbrugghen decided that another classification was required, with just twelve events – The World Cup. Sponsored by Perrier, the event used only the one day classics, not the stages races, and so was based around Milan San-Remo, Paris-Roubaix, The Tour of Flanders, Liege-Bastonge-Liege, Amstel Gold, Classica San Sebastian, GP Zurich, Paris-Tours and the Tour of Lombardy. Eagle eyed observers will count only 9 races here – this is because these are the races that lasted the whole period of 1989-2004, as the competition also included other events, such as the Wincaton classic in England, first held in Newcastle in 1989, before moving to Brighton, then Leeds and finally Rochester in 1997. It was replaced with the HEW Cyclassics in Germany, now Vatenfall Cyclassics, which ran from 1998-2004 in the slot. Also included where the Grand Prix des Ameriques from 1989-1992, The GP de Nations (1990-1993), Japan Cup (1996), Rund um den Henninger-Turm (1995) and the GP de Liberation (1989-1991). It should be noted that many of these races till run, but were simply taken in and out of the World Cup, hence the erratic dates. The most intently political of all the systems, the ProTour gave back the Grand Tours and the Monuments greater status with a greater smattering of points, but then used these points to produce a set of ‘ProTeams’, ie the top 20 teams where effectively in a division unto themselves. They were obliged to ride all the ProTour races, which were set by the UCI, and this is where problems began. The UCI, in its bid to push globalisation of the sport, began to push international races with no history into the event, and so the Tour Down Under got equal status with, say, Paris-Nice when it was introduced in 2008 despite having been run for only 9 years. This trend would continue in the next iteration of the ranking, the WorldTour. By 2008 however, the Grand Tours had all pulled out of the system, taking some of the key one day races with them, and thus leaving a rather aborted ranking that was lacking races of prestige – indeed, the Tour Down Under was one of the joint highest scoring events, and only one of the Monuments (The Tour of Flanders) was included. 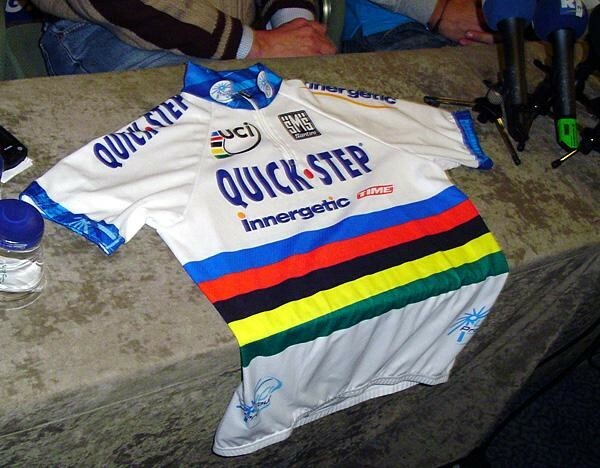 The event had been used as political leverage, and had made the mistake of trying to impose itself too much on the sport, such as in 2006 when the UCI tried to make Tom Boonen wear the all white-blue trimmed leaders jersey they had created for it at Paris-Roubaix rather then the once in a lifetime opportunity to ride the classic in his rainbow jersey (In the end, a hyrbid jersey was created). Thus, in 2008, it was ‘revamped’ into the WorldTour. Lance Armstrong was the honorary holder of the first ProTour jersey. ‘World’ was indeed the principal part of this new iteration, which saw yet more interference into the teams schedules from the UCI. They created new events, the most obvious being the Tour of Beijing, essentially to make a profit, even though none of the teams wanted to go and no one in China appeared interested. The event now serves purely as an opportunity to gain much needed points to stay in the WorldTour top tier, thanks to the stupid new points system much lambasted in this blog. The Leader’s jersey of the ProTour was now gone, and some stability seems to be there for the moment, though rumours of breakaway leagues, based around awful sounding four day races with no history that will be invented with a flat stage, a hilly stage, a time trial and a mountain stage, continue to swirl, and the teams are increasingly annoyed about having to go to Chinese races, especially after the UCI created another one, only for it not to go ahead. 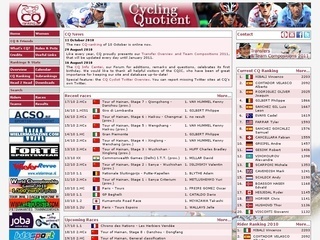 Cycling Quotient, at http://www.cqranking.com/men/asp/gen/start.asp, is an excellent resource and ranking system, which seems to balance the characteristics of various races equally and uses the system of the World Rankings, in that it keeps the points from the previous year on record. Thus, if you defend your title, you gain more points for having done so. Points are also awarded for holding a leaders jersey, or winning one other then the GC, which helps the puncheurs and sprinters compete on a level playing field. Supposedly, it’s even used by team managers trying to find new talent, and indeed, with the myriad of stats and graphs to compare riders and a like, you can see why. This is a system devised by IG Markets, a financial data provider, who sponsor Team Sky, which is important given one of the criteria in the system is based on people’s judgement of races and ‘panache’. The system is also weighted depending on the more prestigous races, but in a good addition, gives bonuses for various achievements, including ‘Queen stages in grand Tours’, multiple grand tour stage wins, winning more then one cobbled classic, Ardenne Classic or autumn classic, and, despite it being done only twice since 1998, doing a Grand Tour double. 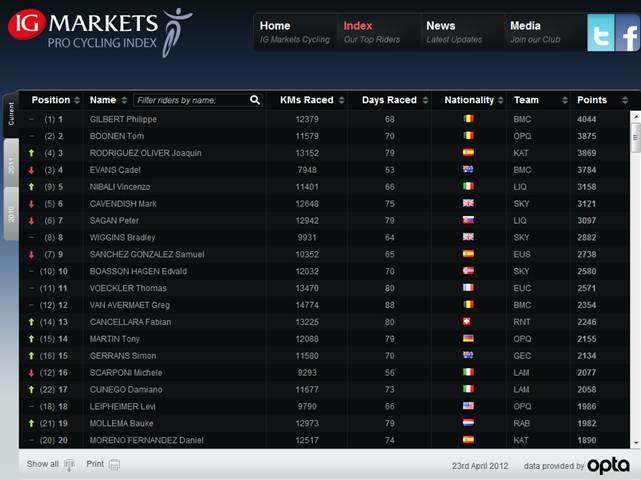 It may be perceived as biased given the Sky connection, and has some odd anomalies, with for instance certain national championships being worth more then others, but it is still a good system, which puts riders who are under ranked in the UCI systems in a more reasonable place, a la CQ rankings, which is more useful. This table is complicated by the overlap of some of the systems. I did originally have nations and teams in as well, but it was a huge mess, so it’s just the individual rankings. The left most name up to 1988 is the Super Prestige winner, the names on the right of these from 1984 to 1988 are the UCI World Rankings winners, and these then become the left most name from 1989. The right hand name from 1989 is the World Cup winner. Confused!? So was I putting it together!